2015 year in review. It has been a great year for Race For The Wounded, we have made some of our nations warriors very happy and for that we are grateful. We are also very grateful for the sponsors that have helped us through the year. The year started off at the Colin Edwards Texas Tornado Boot Camp. Craig Hall was getting ready for the Mexican 1000 and as always the TTBC team was there to help our wounded veterans in any way that they can. A big surprise came from MotovationUSA when they contacted us about donating a Yamaha FZ-9 that we auctioned off. It was great to see them pull into the Texas Tornado Bootcamp with the bike in the back of the truck. Colin put his signature on the bike then they had it clear coated for one lucky person. After that it was time for the Mint 400 with Joseph Gavin, Blaine Sullivan, and Jerry Little. It was a great race with the team taking a 4th place and only 4 min off of 3rd. Then it was on to Blackwater TX for the Texas Raptor Runs It was a great time being with a bunch of off road texans. 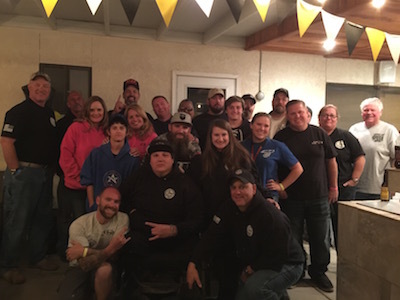 They helped us raise money to get more of our wounded veterans racing and showed us a great time in the rain. We also got to know Patricia Bott who would race with us in the last race of the year. Next was Craig Hall and our own Tony Scott racing the Mexican 1000. What a race and what a time had by all. As you know Tony is our Truck Program Manager but for this race he was one of our wounded veterans. Tony has put everything into Race For The Wounded, sponsoring us with his truck and his driving. In all the years Tony has raced he has never raced in Baja. Tony was wounded in the 1st gulf war and putting him into this race with Craig was the best way I could think of to try and thank him for all of the joy he has given our wounded veterans. How did they do??? Well how about a 1st in Class and 7th overall on a 1971 Honda SL350. 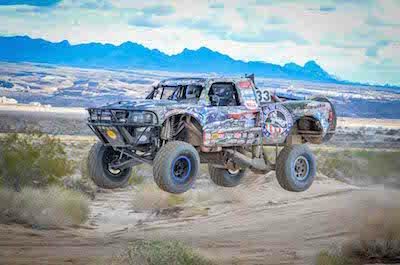 May was Caliente 250 and back in the truck with Joshua Sust and Curtis Armstrong rocking in the co-driver seat of the Tony Scott Trophy Truck. It was a fun race with a 3rd in class finish!!! In August we were on our way back to TTBC with Lymarie Paulick on the way to the camp I was contacted by her letting me know she couldn’t make it due to medical problems. I was just outside the camp so I went and very happy I did. Dan Peterson called and wanted to meet me before he got into the truck for the Kingman race. I was lucky enough to spend the day with him shooting at Colin’s place getting to know him. This was something new and I liked it, most of the time we don’t meet the veterans before they show for the training. Next we were back in Vegas for the SNORE picnic, bowling and VEGAS OFF-ROAD EXPERIENCE (VORE). SNORE, VORE, and Sam’s Town Hotel and Casino – Las Vegas came together for a military appreciation day. VORE donated the track Sams Town the rooms and SNORE set everything up. Giving rides to all military and their family members. I hope that we can do something like this again. With the help of about 15 members of the racing community bringing their own race vehicles out to give rides to our troops. What a great weekend and what a great community. 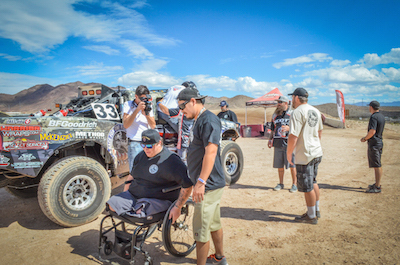 Next up was the AZ off-road expo to help raise awareness to what Race For The Wounded is doing for our veterans. It was a good time and we were lucky enough to meet our newest member of the team. Polly Treadway who will be helping us raise money and awareness as the Head of Marketing. Then it was back to the Texas Tornado Bootcamp with Matthew Dalrymple. We had 4 days of riding, shooting and the best instruction you can get in the world from Colin and his team. Next up was the Kingman race with Dan Peterson, our other veteran couldn’t make the trip so it was up to Dan and Russ Pearlman a wounded veteran who we put into the 2014 Mexican 1000 and is now a volunteer for us. They had a great race taking a 3rd place! We are also happy to tell you that Dan is now in the The Fab School he hopes to work with his new skills after graduation helping bring more wounded veterans into the Race For The Wounded family. Desert Fanatics put on a Flag run every year and donate the money to a charity and this year it was Race For The Wound. We had the truck on display and took part in this cool event. I think it was close to 500 trucks driving a loop all proudly flying the American Flag!!! And for the last race of the year it was the RAGE AT THE RIVER with Patricia Bott and Matthew Krumwiede. 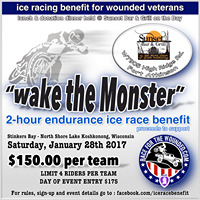 This is a two day race with each of the veterans taking a full day in the truck. This year the race had 400 vehicles and Patricia, Matt, and Tony got the truck to a 5th in class and 7th overall. It was a great way to finish the year. Thank you to all of our sponsors and all that support us!